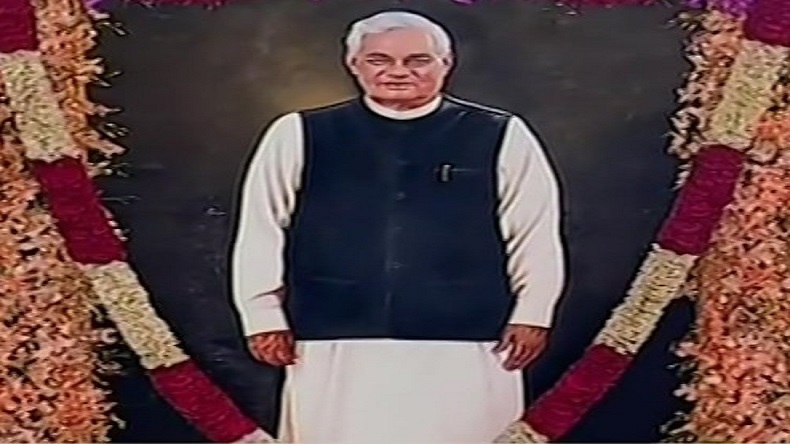 Former Prime Minister Atal Bihari Vajpayee’s portrait has been unveiled in Parliament’s Central Hall by President Ram Nath Kovind on Tuesday. The ceremony was attended by Prime Minister Narendra Modi, Vice President M. Venkiah Naidu and Lok Sabha Speaker Sumitra Mahajan. The statue was moulded by artist Krishna Kanhai and donated by Lok Abhiyan Sanstha. At the inauguration ceremony, Kanahi was felicitated as well. The artist has painted Vajpayee in his signature dhoti-kurta and sleeveless black jacket. Vajpayee’s portrait has been placed beside Lala Lajpat Rai’s portrait. A 13-member Parliamentary Committee, headed by Sumitra Mahajan, was made to decide on the installation of Portraits of National leaders and Parliamentarians. Vajpayee, who served the country thrice as Prime Minister was the founder of Bharatiya Jana Sangh, later called Janata Party. He’s also as one of the founding members of Bharatiya Janata Party. The former Prime Minister passed away last year on August 16 after a prolonged illness. Speaking at the ceremony, PM Modi praised Vajpayee and said that three-time Prime Minister had a long political career, including his active role as a leader of opposition in the initial days of BJP. Calling him a legendary orator, the PM added that Vajpayee’s communication skills were unmatchable and that the man also had a great sense of humour. In a tribute to Vajpayee, President Kovind described Vajpayee as a school of public life who enhanced distance connectivity through infrastructural reforms including changes in IT and telecom sector too.Other leaders present at the ceremony were Vice-President Venkaih Naidu, Ghulam Nabi Azad, Narendra Singh Tomar.